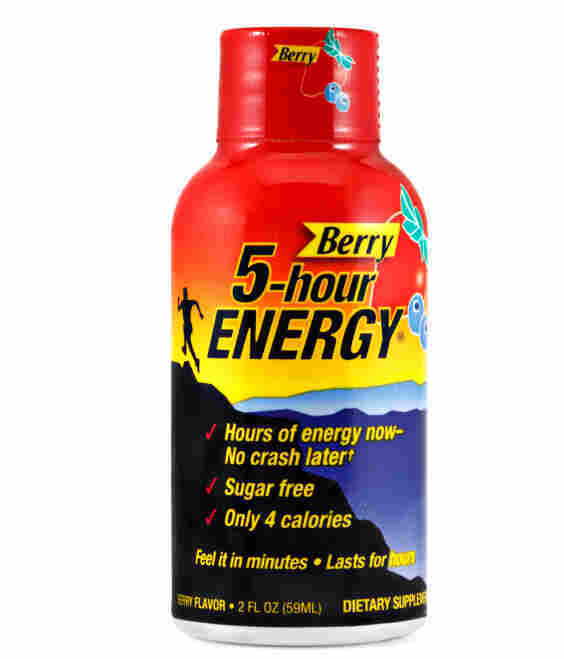 An Impossible Standard: When NPR Covers Its Sponsors : NPR Public Editor A segment on All Things Considered about the founder of 5-Hour Energy raised concerns among listeners about conflict of interest and a violation of NPR's new ethics handbook. When host Audie Cornish drank a bottle of 5-Hour Energy on All Things Considered, several listeners were not entertained. Cornish's act and the interview that followed were a conflict of interest and violated NPR's new ethics code, they said. The company that makes the drink, Living Essentials, is an NPR corporate sponsor. "I have heard their name in underwriting spots for at least the last month and again this morning," wrote Steve Tadd of Cherry Hill, NJ. "The ATC story had no disclaimer about the NPR sponsorship. I thought the story was unworthy of airing and a shill." "It was a 5-minute infomercial," wrote Linda Mattson, of San Carlos, CA. "Not a single item indicating any critical thinking skills were displayed. Perhaps you might have looked into the potential health risks of mega vitamins." Ms. Mattson makes a good point, and that is doubly unfortunate because it undermines the argument I am about to make next about my real concern: sponsorship and conflict of interest. The segment did not need to acknowledge that Living Essentials is a sponsor. Hardly any story on a company that is a sponsor should. The new ethics handbook does indeed require such disclosure, but the handbook—though not yet a month old—should be revised. I am happy to say that that revision is now under way. You either trust NPR's reporters and editors to be impartial, or you don't. My position may sound treasonous for an ombudsman. Aren't we supposed to be concerned about the slightest appearance of a conflict of interest? Yes, we are. But as a former editor and publisher, I know that some realism is required here. There is no way to totally eliminate the appearance of all conflicts of interest, and sometimes the conflict itself. Any system comes down at some point to trust. You either trust NPR's reporters and editors to be impartial, or you don't. Conflicts of interest come in many shapes — financial holdings, romantic relationships, family ties, book deals, speaking engagements, and others. It's important to regularly review how our connections are entangled with the subjects of our reporting, and when necessary, to take action. In minor cases, we might satisfy an apparent conflict by prominently disclosing it, and perhaps explaining to the public why it doesn't compromise our work. When presented with more significant conflicts that might affect our ongoing work, our best response is to avoid them. But some conflicts are unavoidable, and may require us to recuse ourselves from certain coverage. But corporate sponsorships present a different case. While public media often tries to deny it, sponsorships are no different from advertisements in commercial media in the crucial aspect that money passes hands. You can argue that you don't want your public media to have any tie to grubby, profit-seeking companies. But if you like public media, you would be shooting yourself in the foot. A quarter of NPR's budget and a fifth of the aggregate budget of member stations comes from corporate sponsorship. Cutting out the sponsorships would kill the excellence of their journalism. And if you think that the foundations, governments and private individuals who pay most of the rest are any less dangerous to impartial news coverage than corporations, you would be grossly mistaken. Sponsorships are like advertising in this crucial way: money passes hands. If anything, these latter are often interested in advocating a message and thus more prone to want to interfere in the news. Companies are most interested in getting their name before NPR's audience. They are, in other words, more interested in you than they are in NPR's journalism. NPR's sponsors might at the same time be advertising in The New York Times, The Wall Street Journal and Fox News. Maybe even the Rush Limbaugh show. American corporations have been trained for more than a century that there is a firewall between advertising and editorial in the professional mainstream media, and this firewall exists in spades inside NPR. We have, sadly, become a cynical people in recent years, quick to believe that sinister forces are somehow at work in much of public life, and, so, many readers may guffaw about firewalls. They are wrong. NPR's sponsors might at the same time be advertising in the NYT, the WSJ, Fox—maybe even Rush Limbaugh. I would be shocked if it even enters into the mind of any NPR journalist—as well as those in almost all of the mainstream media—to do, not do or shade a story because a company is a sponsor or advertiser or not. The staff that sells sponsorships does not contact the newsroom to ask for coverage favor for a corporate client. To do so is a firing offense. Companies and marketers almost universally know not to ask journalists for coverage favors in return for sponsorship and advertising. To do so would be an insult—like asking a professional journalist to be a prostitute. It would invite distrust and negative coverage. It also would undermine the independence that attracted NPR's coveted audience in the first place. I am not saying that there haven't been slip-ups. But they are so rare that they prove the rule. I say this after almost a year at NPR and after having been a reporter, editor or columnist at The New York Times, The Wall Street Journal,The Washington Post, The Philadelphia Inquirer, The Miami Herald, The Boston Globe and the Quincy (MA) Patriot Ledger. I was the founder and publisher of the Rumbo chain of Spanish-language newspapers in Texas. And I am a visiting professor at the Columbia University Graduate School of Journalism, which like every journalism school in the country, pounds ethics into each new generation of journalists. It would be a logistical nightmare and senseless use of time on air and space on line to repeat a rote statement about a company being a sponsor. Sponsorship announcements do differ from advertising in that the message is short—10 seconds—and cannot be a call to action, a sales promotion or comparative with competitors, according to Steve Moss, the CEO of National Public Media, which is charged with selling the corporate underwriting. NPM is majority owned by NPR, in partnership with PBS and WGBH of Boston. NPR has had 175 corporate underwriters over the last fiscal year, Moss said. It would be a logistical nightmare and senseless use of time on air and space on line to repeat a rote statement about a company being a sponsor each time one of the 175 are mentioned in a story. And what about new sponsors NPM might be seeking to attract? Or a past sponsor? And even if disclosure were done, you still have to trust that the NPR staffers involved didn't shade the story one way or the other because of the sponsor. This is what I mean by how it always comes down to trust in the end. Chris Turpin, the executive producer of All Things Considered, added an opposite way of looking at the matter: "Rote disclosures of every connection to a sponsor would not only clutter our programs, and be rendered meaningless in the process, but would also require producers to have an awareness of our corporate supporters that could actually be counter-productive and erode our firewall." That lack of awareness has led to some embarrassments in the past. Online spots from America's Natural Gas Alliance once ran next to a series on fracking, for example. Music and movie spots have run near reviews on the album or movie in question. Such a physical link raises so much suspicion of a conflict of interest that it must be severed. The production staff has quickly moved the spots when brought to their attention. They are charged with being on the lookout to prevent more. There are times when disclosure is necessary, which suggests that what is needed is judgment by senior editors and producers. For listeners and readers, meanwhile, it already is quite obvious who the sponsors are: you hear their names on the air or see their presence in the web site. It is for these same reasons that newspapers and commercial television and radio don't announce in each story when an advertiser is involved. There are, of course, times when acknowledgment is necessary. They might include when the sponsorship itself is at issue in a story. What this then suggests is that judgment is required on the part of senior editors and producers, and this is precisely the direction that the newsroom is considering as it revises the new ethics handbook. "NPR has long provided on-air disclosures when there was a potential conflict of interest, or the appearance of one," said Deputy Managing Editor Stu Seidel, who oversees standards and practices in the newsroom. "We will continue to do so. We also intend to expand our transparency about the sources of our funding. We're still hammering out the details of how we will accomplish that. But when it's settled, our practices will be incorporated into the ethics handbook." Again, our sponsorship and development departments are there to support us in our service to the public, not vice versa. Part of the job of these departments is making our funders aware that we will be editorially blind to their support – that we'll conduct our journalism with no favor or slight to them or their interests. They also vet potential supporters to make sure their interests don't present an actual or apparent conflict with our mission. We've often spoken of a "firewall" that separates NPR's journalists from our funders. Properly understood, the firewall is a useful metaphor. In engineering, a firewall isn't an impassable boundary, but rather a barrier designed to contain the spread of a dangerous or corrupting force. Similarly, the purpose of our firewall is to hold in check the influence our funders have over our journalism. I think the simple answer is you can't include every single angle in one conversation. The interview was about the man and the business, more than the health pros and cons of the product itself, that's a different conversation altogether. Considering that the story was based on an article that ran in Forbes magazine, and the interview was with the reporter, not with someone from the company, Turpin's explanation is defensible. But to not even mention that the health risks for adults and, especially, students are so front and center in today's public debate seems to me to be such an obvious omission. It turns the segment into such a puff piece that it is no wonder listeners questioned a conflict of interest. This was, at best, unfortunate. Stephannie Stokes contributed to this post. Please continue the discussion on Twitter or at my Facebook page. This post originally linked to an incorrect set of underwriting guidelines. The link has since been removed, and you can find the complete set here.